Long stitches create an intriguing color-change effect in this cheerful throw. 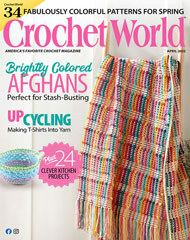 This e-pattern was originally published in the February 2012 issue of Crochet World magazine. Size: 48" x 62". Made with medium (worsted) weight yarn and size J/10/6mm hook.